We offer a broad array of Holographic Scratch, which are also known as scratch cards in general. This range has already received a lot of appreciation from our clients due to its effectiveness quality. They are highly capable in adding more value to the promotions as well as security. We provide them in numerous shapes and forms as per the demand of our clients. Scratch hologram is widely used to cover Pin codes for discount coupons, the banking, mobile cards, password, etc on mobile card, lottery, ticket, member shipment card, bank document, etc, for high security purposes. These offered labels can carry any kind of information under the scratch coat are the most secure and fool proof tools in the card industry. Further, these are suitable for promotion vouchers also. These offered Hologram Scratch off Labels can also be customized by us as per the specifications of the customers and they can be availed in a range of shapes and in a range of sizes. 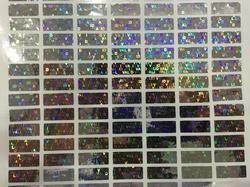 Looking for Holographic Scratch ?